In early 2007 David Scott created a game called Flash Element TD that was an overnight sensation, reaching 2 million plays in only two days. A few months later, Paul Preece (a friend of Scott’s) decided to see if he could replicate the success of Flash Element, and went on to create Desktop Tower Defense – a game so popular and addictive that we said it should be banned. That June the two paired up to create a gaming company called The Casual Collective, and has been toiling for over a year to produce a crop of games that is now ready to make its public debut. Tonight The Casual Collective is launching with eight games (four of which are brand new), all crafted by Preece and Scott, and many of which seem to be every bit as addictive as their now-classic games. Available games include Minions, which is reminiscent of a streamlined Command and Conquer, a platform game called Buggle Stars, and updates to Flash Element TD and Desktop Tower Defense. 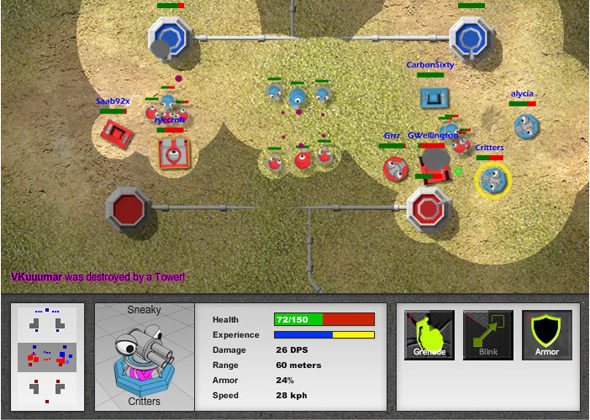 Some of the games are notable for their multiplayer support, allowing up to twelve players to simultaneous play (while asynchronous Flash games like Chess are common, large fast paced games are much rarer). The site also includes support for social communication, offering a news feed featuring high scores and game invitations (though the founders emphasize that The Casual Collective has no intention of becoming its own social network). At this point social items are restricted to within The Casual Collective, but in the future the site may support distribution of high scores and other updates through other channels, like Facebook’s News Feed. The site plans to monetize by offering bonus packs for certain games at around $2.25 per game. Each bonus pack will offer extra options or characters to enhance gameplay, but all games will be free and fully playable without the packs. The company will also be able to collect advertising revenue on its games as they get syndicated across the web, as it has integrated its own advertising platform. The Casual Collective has raised $1 million from Lightspeed Venture Partners in seed funding. The Casual Collective will see competition from countless other Flash game developers, but the founders are standouts in a pool otherwise primarily composed of mediocrity. It may take some time for The Casual Collective to catch on, but with two hits already available and more likely on the way, I won’t be surprised if we have to ban the entire site for wasting too much of our time.